The newest of all three nines, The Catalina Nine was recently renovated in 2012. The course features three par 3 holes and plays to a par of 35. The course wanders through natural arroyos and brings the golfer close up views of the Catalina Mountain range. The signature hole #5 is a risk-reward par 5 featuring a second shot which must carry 250 yards to clear the ditch in the fairway. The Catalina Nine offers a wide variety of golf shots and is regarded among residents as the best layout of the three courses. The Catalina Course begins with the longest par 4 at the facility - 440 yards from the back tees. From the forward tees, long hitters can fly the fairway bunker and receive a yardage boost from the down slope. The second shot is played to a shallow green and the front right bunker receives a good fair of play. This mid-length par 4 gives players several options off the tee. A driver will leave a shorter second shot but will bring the hazard at the end of the fairway into play. The best play from all tee boxes is to choose a club that will leave 100-125 yards to the green. Once on the green, players should pay attention to the left to right, front to back contours. A great par 3 over 190 yards from the back tees. The green is well surrounded by bunkers and a false front edge. The green is undulating and breaks from front to back and left to right. Players should pay close attention to the pin location before club selection. A blind tee shot which may be played over the two fairway bunkers (long hitters have a chance to drive the green on this line from the forward tees) or out towards the center of the fairway. The fairway does end approximately 100 yards from the green on the right side of the fairway. The second shot is played downhill to a green which slopes from back to front with many subtle contours. Known as the "double ditch" hole to members, this hole is a long par 5 where strategy really comes into play. 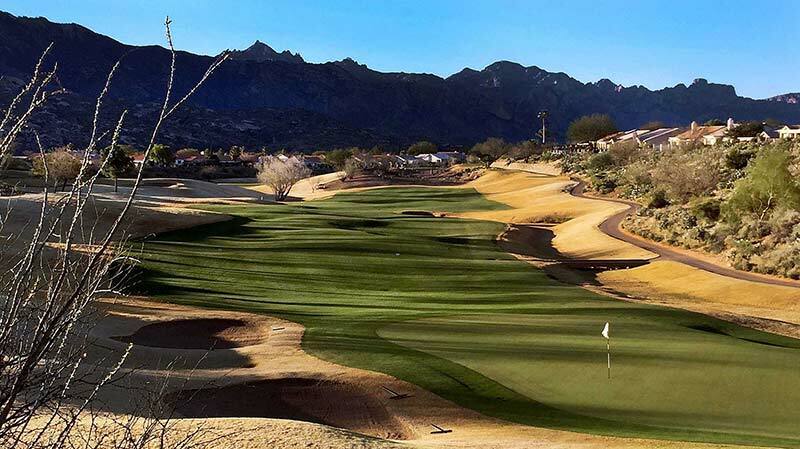 The tee shot is played to a plateaued fairway while soaking in gorgeous views of the Santa Catalina Mountain Range. On the second shot, players may either try to carry the second drainage ditch or lay-up to an appropriate yardage. The lay-up shot is no picnic as the second fairway slopes towards the ditch on the left and is guarded by a fairway bunker on the right. A great par 5 hole! A short to medium length par 3 where more hole in one shots are recorded than any other hole at SaddleBrooke Golf Club. The hole plays slightly uphill to a green which slopes from left to right. Will you add your name to our hole in one roster? Good Luck! A very good par 4. The tee shot is played to a narrow landing area guarded by a drainage culvert on the left. The second shot plays slightly uphill to a large green guarded by two bunkers on the right and a collection area on the left making the back left pin location a very demanding second shot. A downhill par three which plays one club shorter than the yardage. The green slopes from left to right and front to back. Players should avoid the bunkers right of the green. The Catalina Course finishes with the longest hole on the property. Players should aim their tee shot towards a lone pine tree on the left side of the fairway which will help utilize the left to right sloping fairway. The second shot is played to a narrow landing area which also slopes from left to right and players should avoid the fairway bunker on the right approximately 160 yards from the green. The third shot is played to a two tiered green and depending on the second shot, players may have to play over a grove of trees guarding the right side of the green. Another wonderful strategic par 5 on the Catalina Course.